Outback Steakhouse - Free Appetizer 1/2! Tune in to watch the Outback Bowl on January 1, 2015 at 12 PM/EST on ESPN2 and see which appetizer is unlocked for America! GIVEAWAY - Memphis Monster Jam Tickets! Happy New Year! I thought we should celebrate the start of 2015 with an awesome giveaway. 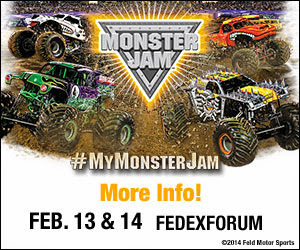 If you haven't heard or seen yet, the Memphis Monster Jam will be at the FedEx Forum February 13th & 14th. My husband and I have attended this event the past couple years as our Valentine's Day date and have had an awesome time. This year we are taking our daughter and can't wait to share the excitement with her. World Champion Tom Meents in Maximum Destruction will be making his triumphant return to Memphis! Don’t miss one of Monster Jam’s best ever as he battles World Champion Bounty Hunter. For the first time ever, the FedExForum will host War Wagon, Mopar Muscle, and Stinger! And returning this year are Barbarian, Scarlet Bandit and Raminator! Eight of the biggest and rowdiest Monster Jam trucks on the planet! Monster Jam® is the most exciting form of family motorsports entertainment. The stars of the show are the biggest performers on four wheels: the Monster Jam trucks! The twelve-feet-tall, ten-thousand-pound machines will bring you to your feet, racing and ripping up a custom-designed track full of obstacles to soar over - OR smash through. The 2015 touring season brings more Monster Jam excitement providing entertainment tailored perfectly for your family's budget, and these colorful, larger-than-life beasts are sure to capture the hearts of both young and old. Tickets: Starting at $15 and Kid Tickets just $5.